This, ladies and gentlemen, is pure progressive metal bliss. 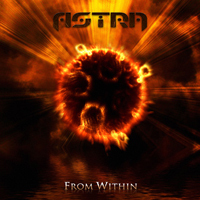 Italian band Astra's second offering, first for Lion Music, plays like a Myung/ Petrucci riff, an Allen/Romeo stanza, and a Mercury/May arrangement. This band has everything you would want in a prog metal band; great harmonies, challenging music, keyboard-guitar trade-off solos, excellent vocals and '70s-influenced mellotron keyboards. It's just a great album through and through. Not to be confused with the American prog band of the same name. Every band member shows off their individual virtuosity, making each song on this release musically pleasing. However, there is uncertainty within the band at this time, as singer Titta Tani has just exited the fold, just after the band had replaced the bassist and keyboardist. On "From Within," every song is catchy and diverse. Their Dream Theater influence is obvious, even winning a Dream Theater tribute band contest in 2002. But Titta Tani's vocals have more of an aggressive sound and are not in the same range as James Labrie's, in which lies the difference between the two bands. I'd say they are also along the lines of fellow countrymen Pathosray, but with more aggressive vocals. Their sound also conjures up similarities to Alcatraz, Queen, Styx, Symphony X, Queensryche and Presto Ballet. CD opener "Over The Hills" starts off, and right away you are blessed with '70s-influenced mellotron keyboards and some well-versed vocals from Titta. There's some great guitar and keyboard soloing during the closing minute of the song. At first listen, "Memories Remain" sounds like Queensryche's "Empire," but then quickly turns in another direction. "The Hitman" moves along nicely with a fast tempo, steady rhythm and aggressive vocals and a nice piano outro. "Simple Mind" has great harmonies with a multi-voice chorus, as well as a '70s prog keyboard solo and excellent guitar work. Astra's fondness for Queen is executed nicely on "Never Say Goodbye," their tribute to Freddie Mercury, even the solo recalls Brian May at his finest. "From Within" will take you by surprise, even if you're not a prog or power metal fan, the music is so infectious and memorable. Fans of anything Dream Theater has ever done, or prog rock in general, will absolutely dig this slab of grooviness. Pick it up!